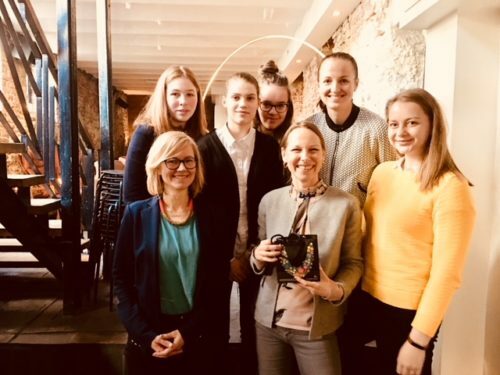 This week Tania Ellis met with Superheroes – an Estonian entrepreneurship & leadership program for 13-17-year-old girls – to share some of her work-life experience, to tell her entrepreneur story about The Social Business Company, and to share our Give & Grow philosophy. Superheroes provides a 4-month program, where the girls get to test their superpowers, boost their life skills, grow their sisterhood and get inspired by diverse role models. Most importantly, they get to make their dreams a reality by running projects they are passionate about. We were so impressed with their projects, which included addressing social issues like the taboos around menstruation and mental health issues through business, building waste and recycling programmes and more. Superheroes is a great contribution to, in particular, Sustainable Development Goal no. 5 – to achieve gender equality and empower all women and girls.